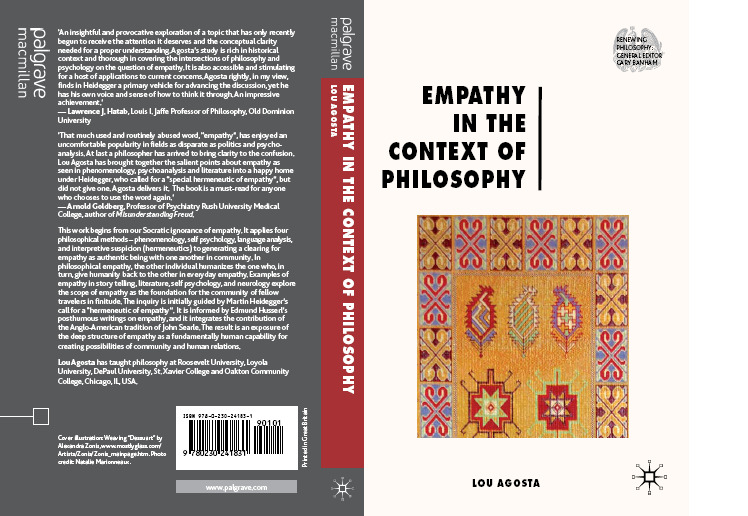 Here is the cover art for Empathy in the Context of Philosopy. The picture is the top third of a weaving by Alex Zonis, my wife. The complete weaving, consisting of 250,000 teeny-tiny glass beads can be seen at www.mostlyglass.com under her name (Zonis). Check it out. My ‘friends’ are telling me ‘Well, at least there is some talent in the family!’ In order to get at the text on the back cover, you may need to see the separate post entitled Advanced Praise for Empathy in the Context of Philosophy. I am humbled by the comments of my colleagues and friends.